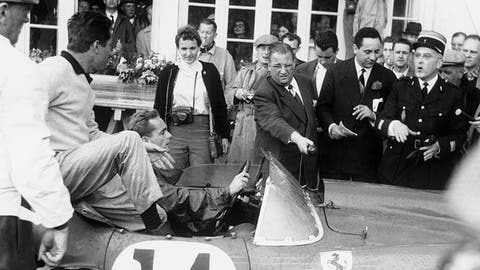 McCluggage, with camera, readies to be among the first to interview Le Mans 24 Hours winners Olivier Gendebien and Phil Hill in 1958. Pioneering racer, historian and automotive journalist Denise McCluggage passed away on Wednesday, May 6 at the age of 88. One of the first female sportswriters in the 1950s, McCluggage covered motorsports and skiing for the New York Herald Tribune before carving out an equally pioneering role as a successful racer. She scored class wins at Sebring in 1961 driving with jazz musician Allen Eager in the GT category driving a 250 GT Scaglietti-bodied, short-wheelbase Ferrari Berlinetta, and at the prestigious Rally Monte Carlo in 1964 driving a Ford Falcon. Along the way, McCluggage befriended many giants of the era including Hill, Juan-Manuel Fangio and Stirling Moss. She went on to enjoy a long career as a published author on racing and motoring – and helped found Competition Press, which later became AutoWeek, where she wrote a weekly column for many years. McCluggage was inducted into the Automotive Hall of Fame and the SCCA Hall of Fame, and also received the Ken Purdy Award for Excellence in Automotive Journalism, the Dean Batchelor Lifetime Achievement Award. "I’ve been at both driving and writing a looong time," McCluggage wrote when introducing her website, DeniseMcCluggage.com, where she continued her passion for all things internal combustion engine-related…along with a few other things: "I got my first driver’s license in 1940. Some 10 years later I was writing about, among other things, cars. Some of those other things will show up here, too. But mostly cars, trucks and a few motorcycles. Well, an airplane or two. Yes, and skis. But mostly cars." Back in 1959, McCluggage appeared on the TV show, "To Tell the Truth" just prior to her second running of the 12 Hours of Sebring. The clip of the show below exemplifies her wealth of knowledge, poise and grace. As Road & Travel magazine put it, "If there was ever a woman that defined ‘cerebral personality,’ basically someone who genuinely maximizes the potential of their brain and spirit, it’s Denise."